Customized Employment is a process for individualizing an employment relationship between a job seeker with a disability and a business in ways that meet the needs of both. Employment specialists do not try to “fit” job seekers into existing positions rather negotiate and customize jobs that match the job seeker’s unique interests and skills while filling a business need. The outcome of customized employment is "real work" for competitive wages that results in a job of choice for the individual with a disability. Currently, the Rehabilitation Research and Training Center on Employment of People with Physical Disabilities is conducting research on customized employment. This includes supporting transition-age youth with physical disabilities in obtaining desired employment outcomes. This case study is one in a series of case studies highlighting how participants are finding employment in community businesses through customized employment. Who is Carlos? What are his strengths, interests, and job preferences? Carlos, not his real name, learned about the RRTC’s research study on customized employment while attending an appointment at the Children’s Hospital of Richmond at Virginia Commonwealth University (VCU). After meeting with staff to discuss the project, Carlos and his family gave their consent for him to participate. The first step in finding a job for Carlos was to learn more about his interests and skills that could match the needs of business. 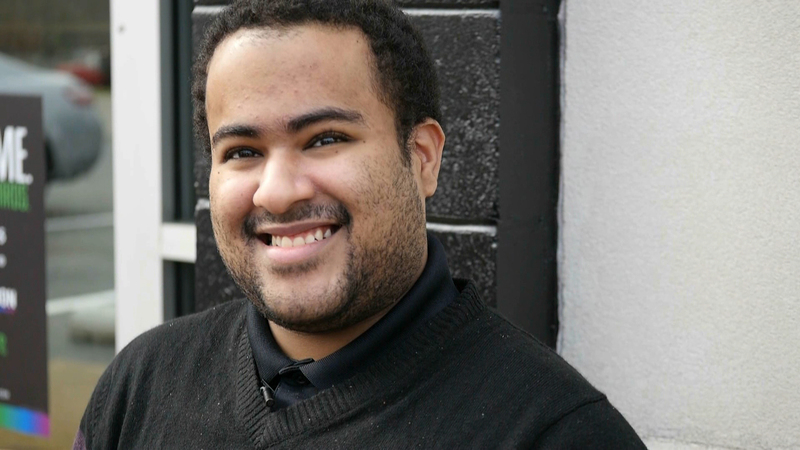 Since graduating high school in 2013, Carlos spent most of his day at home watching television. Carlos wanted to work but did not seem to know what he wanted to do. His mother was his primary companion, and he went with her to social events as well as medical appointments. During Discovery, his employment specialist learned that his personal interests included WWE and using his phone and computer to visit social media sites. She also learned that Carlos translated for his mother who spoke Spanish. 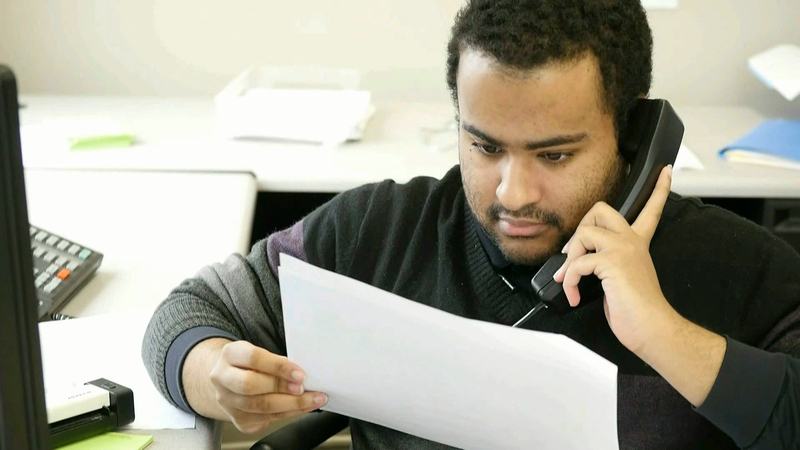 Unsure of Carlos’s translation skills, the employment specialist wondered if he could use this skill to help him find a customized job. She reached out to a friend who speaks Spanish speaker fluently and uses this skill in her job as a human resource manager. The friend agreed to have an informal conversation with Carlos, and she confirmed that he spoke fluently. Next, Carlos completed several Discovery activities to include a job shadow with a multi-lingual receptionist. He also translated an educational brief from English to Spanish, and the human resource manager reviewed it for accuracy. Although he completed both discovery activities successfully, Carlos reported that he did not want to use his translation skills as a primary feature of his job. His case study illustrates the importance of determining what a job seeker is not interested in doing during discovery as well as what he or she is interested in doing. Another important aspect of customized employment is networking with people in the community who are not paid to support individuals with disabilities. Carlos’ case study also illustrates how community partners are important. The Spanish teacher provided a perspective on Carlos’s skills that the employment specialist did not have. Sometimes, staff may be quick to conclude that a job could be customized based on a person’s unique skills while in actuality this is not something the individual wants to do. Skills and hobbies do not necessarily translate into employment, and employment specialists need to be careful not to quickly make this assumption. Although Carlos did not want to use his translation skills for work, these discovery activities helped the employment specialist learn more about his other skills and interests. How was Carlos's job customized? While getting to know Carlos and his interests, one of his vocational interests or themes emerged as clerical or office work. In order to learn more about types of tasks that might be of benefit to business, his employment specialist approached a local auto body business where she knew the owner to conduct an informational interview. The employment specialist asked to observe the administrative side of the business and interview current employees about their job duties. 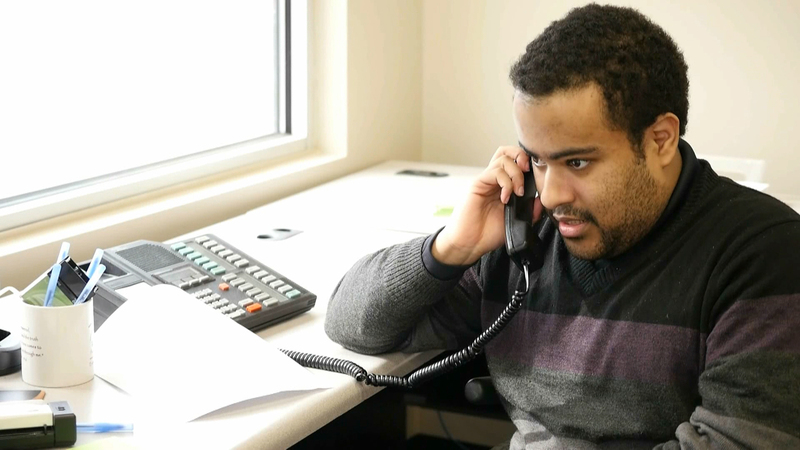 During the observation, Carlos’s employment specialist learned that the individual employed in the customer service position regularly worked overtime. The employee preferred not to work overtime, because it complicated childcare. However, she did so in order to complete time-sensitive tasks. Some of the tasks that were not getting done regularly or were requiring staff overtime included posting return product credits, posting payment checks in daily mail deliveries, preparing repair folders based on upcoming schedules, and scanning repair order paperwork. The employment specialist realized that these job duties were ones that Carlos may be interested in doing. After the informational interview, the employment specialist developed an employment proposal presenting how hiring Carlos could benefit the business. She also presented a list of tasks that, if combined, could result in a customized job description for him. Before submitting the employment proposal, she discussed the tasks with Carlos, and he agreed that he was interested. After considering the proposal, the business hired Carlos as a customer service assistant making the same wages as other employees doing similar job duties. The business was most interested in Carlos helping with creating customer folders, entering time-card information, and entering credit information into the business tracking system. Carlos began working four hours a day, Monday through Friday, in February of 2016. How does Carlos get to work? 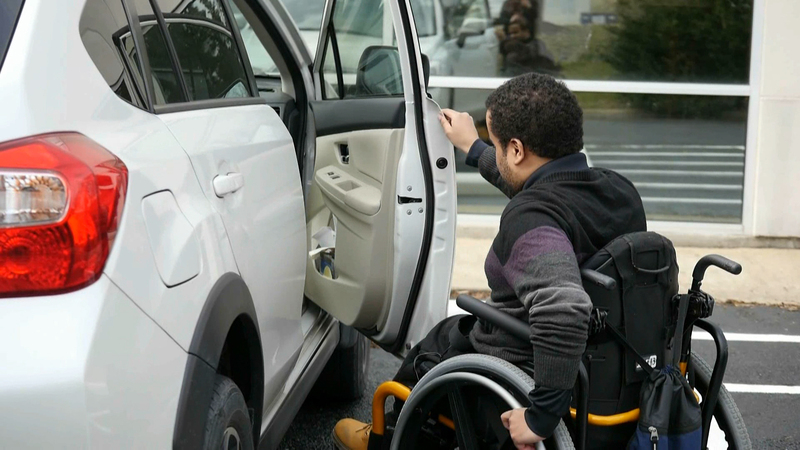 There was a para-transportation company in the area where Carlos lives; however, it would not provide transportation to the business’s location. Initially, vocational rehabilitation (VR) funded Medicaid transportation so that Carlos could get to and from work. After exploring other options with friends and family, Carlos arranged for his uncle to take him to work each morning. The employer changed his schedule to accommodate the time that the uncle could transport him to work. 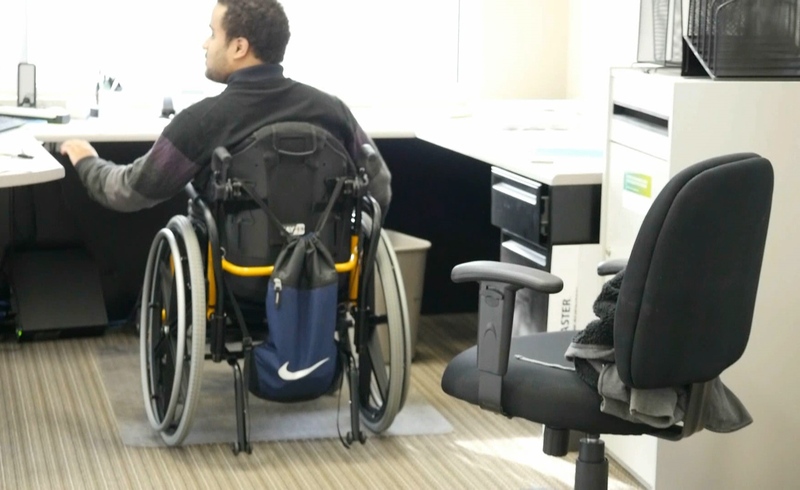 Since Carlos is able to transfer himself from his wheelchair to a car and back to his wheelchair, Carlos’s employment specialist investigated non-para transportation options. She learned of a company called UZURV that uses Uber and Lyft drivers but allows riders to schedule their appointments and select drivers who are willing to make specific accommodations for passengers. The company is new and was beta testing their phone app when the employment specialist learned of UZURV. She reached out to the Vice President of Corporate Outreach explaining Carlos’s situation, and he became a beta test rider. Carlos completed benefits counseling shortly after he started working with a Community Work Incentives Coordinator (CWIC). The benefits counselor worked with Carlos to get his UZURV rides approved as an Impairment Work Related Expense (IRWE). Once approved, the expense to use UZURV has been deducted from his income when determining his monthly social security benefits. How did Carlos learn how to do his job? During discovery activities, Carlos’s employment specialist identified that he learned best when he had a guide or checklist to help him remember steps. 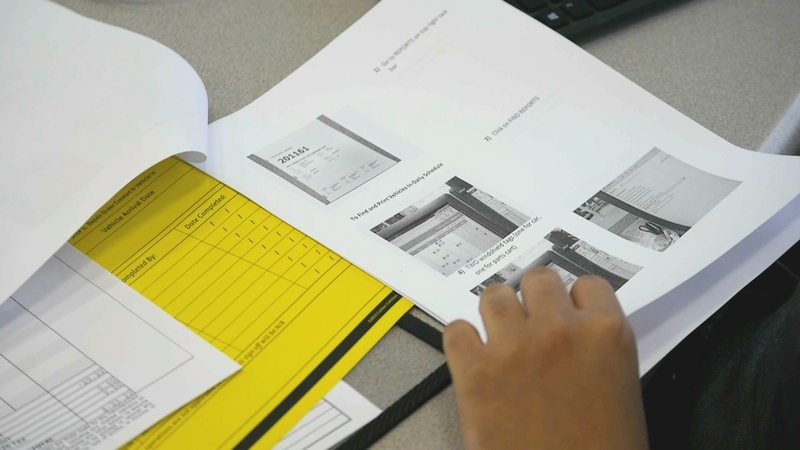 Before Carlos’s first day of work, his employment specialist spent time at the business learning the computer system and took screenshots to develop a visual step-by-step guide for his first day of work. This tool helped Carlos’s learn the steps of his job faster. Although he no longer needs the guide, one of his supervisors has kept it to train new staff on the computer system. What accommodations does Carlos receive at work? Carlos tried three different work areas before settling on the desk that he uses now. From the first day of work, he had his own computer, but he shared a printer located on a shelf that was too high for him to reach. In addition, most his coworkers' workstations were located at a counter that was not accessible. Initially, he worked at the end of the counter using a lower workstation; however, the height was not adjustable and it was simply too high. To reduce his reliance on coworkers to get documents from the printer, Carlos was moved to a room immediately adjacent to the shared workspace where he had access to another printer that was accessible. Eventually, the employer purchased a new printer and placed it in an accessible location for all employees. Now, Carlos’s desk is located in the workspace with his coworkers, and he uses a printer shared by all his coworkers. How has Carlos’s position changed over time? One of the tasks included in the employment proposal was to enter credits into the computer system. Carlos found early success in this task, and his coworker’s appreciation gave Carlos the confidence to increase his responsibilities. Originally, any questions or complicated credits were set aside for his coworkers to follow up with vendors. As Carlos grew more confident and observed his coworkers, he began to call vendors to follow up on unclaimed credits. Now, Carlos has the reputation among his coworkers of aggressively following up with vendors until all credits are collected. A new task naturally emerged as well, and Carlos is now responsible for following up with vendors on deliveries. When Carlos began his job, he was not interested in answering phones, and this was not a negotiated task for his position. Over time, as he became more and more confident, Carlos volunteered to answer phones when the customer service associate was busy. He started by asking a customer to hold until one of his coworkers could answer the phone. As he learned more and more about the auto body shop, he began taking messages when his coworkers could not answer the phone. This increase in responsibilities also means that Carlos is now working five hours a day, five days a week. The cost is “reasonable”, that is, it represents the standard charge for the item or service in the community. UZURV is a Richmond, VA based company that developed an app to let riders schedule and select their Uber or Lyft drivers. This app gives riders the confidence and comfort in knowing who their driver is, and the ability to communicate any special rider requests such as calling ahead or assistance to the car for elderly passengers and passengers with disabilities. UZURV also partnered with VCU Rehabilitation Research and Training Center to offer their drivers an online disability awareness and sensitivity training course. UZURV has expanded their service cities nationwide. The RRTC would like to thank the management and staff of the auto body shop for their continued support and assistance. Carlos has worked since February of 2016 and is a valued and satisfied employee. The project staff members who assisted him in finding and maintaining this customized position are Stephanie Lau and Tomoya Lamberson. The RRTC would also like to acknowledge the support of the Virginia Department for Aging and Rehabilitative Services (VA DARS) who assisted with transportation early in his employment.